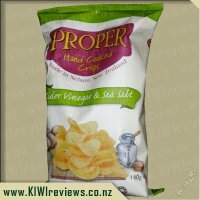 So with yet another visit to the supermarket this morning came another purchase of Proper crisps, this time with us trying the Marlborough Sea Salt flavour. I must admit that I am not the biggest fan of plain or ready salted potato chips as I do prefer something with a bit of flavour, but after having tried the Balsamic Vinegar and Sea Salt and the Smoked Paprika varieties I was ready to give these ones a shot, as I lived in hope that maybe, just maybe they would live up to the wonderfully high standards of the others. I decided to use these chips to make a chip sandwich for lunch, obviously sampling one, or two, or three before hand. This I must say was by far the crunchiest and full flavoured chip sandwich I have ever made, and even though the chips were super crunchy I didn&apos;t have any problems with them breaking up when I took a mouthful, which did impress me, as sometimes chip sandwiches can create an awfully crumbly chip mess. These chips were fantastic full of flavour but not so salty that they leave your mouth stingy from having bucket loads of salt added to them. They were super crunchy even more so than your average kettle chip, in fact I don&apos;t think you could make them any crunchier. 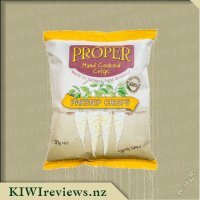 As I am righting this review I am finishing off the bag of these delightful chips with a side of kiwi onion dip and they go together like a match made in heaven. 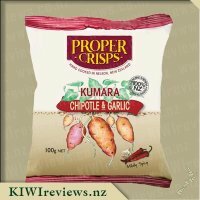 They may be a bit over priced compared to other chips, but for the ultimate crunch and flavour they are worth every penny. I&apos;m quite a fan of salty chips and a sea salt variety was always going to be a favourite. Along with the salt & vinegar variety this bag didn&apos;t last long enough to try any different methods of use for them. 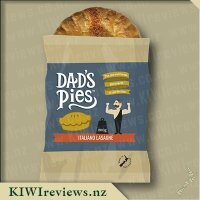 The family hoed into these way too quickly and again, like the S&V flavour the salt is not too over powering like some brands can be. I can honestly say I do not believe I have had a nicer salted crisp. The crispness of these chips is something much different to other brands I have tried and most likely has a lot to do with the design of the bag and the hand made technique used to make these. The fact of how crisp they are makes them taste so much fresher and you you feel like you&apos;re eating something healthy. Whilst the price is higher than the more common brands I do believe that I would hands down buy these over any other variety if they were available on the shelves. Great for that extra bit of panache to your next party. The bags are so easy to open. Writing is easy to read. I really enjoyed these chips as they are very flavourful but the salt doesn&apos;t burn my lips or tongue like other salty chips I have eaten. After reading the ingredients I was happy to give them to my son as a treat. 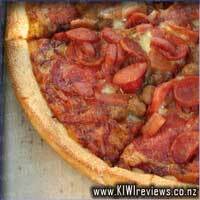 I like that they are cooked in sunflower oil as a healthier option. We ate about half the pack then decided to do something different. I put them on a sandwich with lettuce, Marmite and the chippies. So yummy. gave a lovely crunch. I couldn&apos;t eat all of mine at the time so left half for later. I went to eat the other half expecting the chips to be soggy by now( like most chip sandwiches I make), much to my surprise they still had a fair bit of crunch. 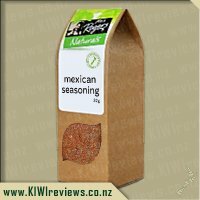 The price is very reasonable for the quality and I have recommended to others already and bought again in my general supermarket shop they are so yummy. We have been eating this Marlborough Sea Salt variety since the crisps were first mentioned in a food magazine and we saw them appear at New World. We have even gone as far as going out of our way to purchase them even though they are more costly than other crisps/chippies, that says a lot. 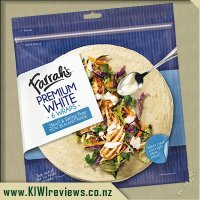 Often there are deals on for 3 cheap packets for the same price as one of these. If we are having crisps, we go for these. As they are a treat food we decide to go for the best. And the best is what these crisps are. They are crunchy, tasty and have a good flavour balance. A couple of handfuls of these and I am in crisp heaven. I would like to say I concocted some wonderful recipe to use these up but no, they were deemed only for eating. I did do the crisps in a marmite sandwich thing and they stood up well, had a nice crunch and could be tasted over the marmite. So, all up, these are worth the extra $ and a trip to a supermarket just because you know that shop stocks them. 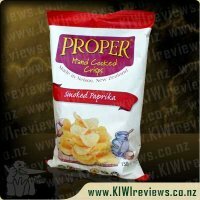 Proper crisps is what ended up in my hands recently and crisps they are. I guess the closest thing I can compare these too if you haven&apos;t had a chance to try them yet is a kettle chip. They are thinly cut and cooked in sunflower oil and only have the flavour added that they are supposed to be, that is a total of 3 ingredients, none of this crazy numbering stuff you will find on other "chips". Crisps are the correct definition for these, they are crisp and totally different to a standard chip, I love the distinction. 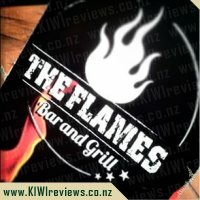 I also liked checking out their website and finding out about the journey of traveling the world and learning how to make the best crisp they could. Each bag also has who made these chips for you by hand, the type of potato used. For flavouring of this crisp it is sea salt sourced from Marlbrorough. I will be the first to admit a salt flavoured crisp isn&apos;t the number one flavour I like, but these sure were tasty, just the right amount of salt, and you can taste the potato, something other manufacturers forget about I think. 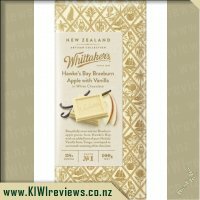 I think the price is a little high compared to other products, but for this product it is a premium type of snack, and it deserves the price, once you realise these are hand made and you taste the taste, well done. When we got these crisps for review, this was the first bag I went for. These were rather tasty, my Dad used these to make some Nachos, with the crisps replacing the nacho chips. The overall taste was good, though as that time my lips were dry, so the salt cased a bit of pain, but that was only a small thing. However, the chips were a bit bland, as most ready-salted crisps are, but the potato was enough to make these things taste good! 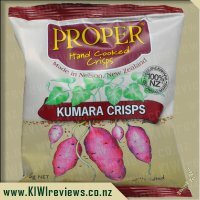 It is amazing to look at these chips and know that they were hand made, but they were so thin that, at the Auckland Food Show where I first heard about this brand, I asked my Dad how they managed to take a potato and make wafer-thin slices. My response was that they were laser-cut, but, in fairness, this does not completely ruin things, as I wouldn&apos;t want to be the one to slice those potatoes! The portion size is good, it makes a good food item to casually eat at home, or take to the movies, but even after eating the whole bag I still wanted more. Also, after seeing the large amounts of recipes on Facebook, I can see that these chips are highly versatile, able to be used in Nachos, cookies, etc. This flavour of crisps is good, but on a scale of 1 to 4, the Smoked Paprika crisps ranked at 4, the Sea Salt and Vinegar ones ranked at 3, these crisps came in at 2, but the Rosemary and Thyme flavoured chips ranked at 1, so they were my least favourite. Overall, these chips may not be the best of the lot from my point of view, but I am not writing them off as "the worst" either. I highly recommend these chips for anyone who wants additive-free, good tasting and salty crisps, so enjoy! I might be a bit strange, but to me there is nothing better than a ready salted chip. My all-time-favourite chip flavour is salted and I would overlook all other flavours especially if that chip is in a kettle style. For this reason this flavour was by far and away my favourite out of the Proper Crisp range. These chips have a very satisfying crunch. They have a great salty taste too. Not too salty that you feel like you need to wipe the chip before eating. They do have an oily texture, which is consistent with kettle style chips. Overall, it was a texture, and taste that I loved. Apart from just eating these from the bag while watching TV, I also tried these in my favourite sandwich of all time. This involved two pieces of bread, butter, marmite and a handful of Marlborough Sea Salt chips. This sandwich was so nice and crunchy. Even though the bag had been open a good two days, they retained that crunch! Another thing I did was make a chewy cookie with Billington&apos;s sugar and the Marlborough Sea Salt chips crushed into the mix. The cookies came out with a great mix of sweet to salty. The chips inside the mixture went a bit soft and it felt like cornflakes as I ate them. My toddler enjoyed the cookies a lot, though the rest of the family thought they were a bit too experimental. 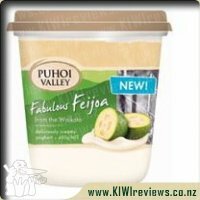 I would buy this flavour again, just to munch on! I am not an eater on salt chips, ready salted crisps etc, if it is plain salt I simply don&apos;t touch it. About once a year I will eat one chip or half a one, but never more than that as they have a nasty habit of making me nauseous. SO I gave a chip a try, my feeling is that even if I don&apos;t like something, if I got it to review then I need to at least try it once. I ate one crisp and was most happy when it didn&apos;t make me feel sick, in fact, for the first time in over ten years I was able to eat a handful of salt crisps/chips!!! In experimental mode I crushed up one cups worth of the Sea Salt crisps, and then I mixed it into a shortbread biscuit recipe. Bake the cookies as normal and let it cool down. Not too sure what to expect, gave it a try, and it&apos;s pretty good. You get the sweetness from the sugar in the biscuits, salt from the chips and a slight nutty taste thanks to the crisps. I love that this has only three ingredients, potatoes, salt and sunflower oil. It&apos;s great to know that I can finally buy salted chips again, but it will be as a treat or at birthday parties. Of all the crisps this was probably my favourite, I loved the subtly of the flavour. There wasn&apos;t a lot of saltiness which made them ideal as an alternative to corn chips in nachos for the kids dinner. The great thing about them in this was that because they are quite crunchy almost like a kettle chip they stayed quite crisp even with the addition of the mince. The kids loved it and probably ate more chips than mince and I felt good about them doing that because there really isn&apos;t anything bad in the crisps. I had plans to do so much more with these crisps, but on returning from work one day I found the packet completely empty. My partner and the kids had sat down and polished off close to 1/2 a packet in one seating. They had got out a tub of garlic hummus and scoffed the lot, telling me they were great and could I please buy more! 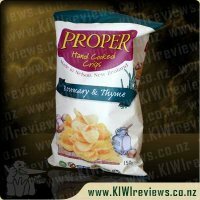 I had a look on the proper crisps website to find a local stockist which was quite handy as it gave you exact locations. I found a location really close to us at a health shop in Bethlehem so went and had a look. I was a bit shocked at the price being $4.25 because I didn&apos;t expect them to be that pricey, so it is probably a product I wouldn&apos;t buy very often as it is just not a treat that fits well with our budget. 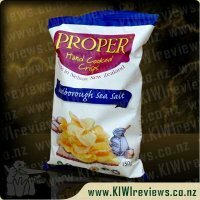 To be honest the Marlborough Sea Salt Proper Crisps were the least appealing of the four varieties we were given to review. This is only because the other flavours were so appealing. I still managed to polish most of the packet off alone in front of the television. Oopsie! One of my favourite childhood foods was Vegemite or Marmite and chippie sandwiches I decided this was the variety of crisps to relive these memories. I wasn&apos;t wrong. These have a great crunch and a subtle flavour so they went well with the Strong Marmite flavour. The sandwiches were a big hit with the kids. I didn&apos;t find these as salty as many of the ready salted chips I have tried. My fingers weren&apos;t left covered in salt which was a pleasant surprise. I also found the crumbs in the bottom of the bag weren&apos;t any saltier than the rest. The dominant flavour was the sunflower oil which was nicer than than the oils used in cheaper chips. It did however leave my fingers slightly greasy. If you are a salted chips person than you will discover this is a quality crisp that will be regularly on your shopping list. Still recovering from my overdose a few days previous on two bags of Proper Crisps in one day today I decided to let the rest of the family eat these. Miss Six loved the illustration&apos;s on this packet, being potatoes, salt and the resulting Crisps. She did ask why there wasn&apos;t a bottle of oil which I thought was very observant and a very good point but we then noticed that all the bags are illustrated the same, so generic to the brand, as opposed to the different flavours on offer. We had a chat about how these crisps are hand cooked (this bag was cooked by Troy using Agria potatoes) and that Crisp&apos;s are what "chips" are named in England where chips means the chips as in fish &apos;n&apos; chips. It probably means that all "chips" will be called crisps now! Rather interestingly this packet despite being 150 grams in size, as were the other packets, had the serving size at 40 grams not 50 grams and 3.7 as opposed to three servings. Not sure why this is as they have less fat than the Smoked Paprika and the Salt and Vinegar which have serving sizes of 50 grams. Anyway we split the bag into four and a half bowls (the half for me) which seemed to be enough for everyone. Everyone liked them and they were all eaten pretty quick though comment was made that they seemed oily. At 35 grams of fat per 100 grams they are indeed oily. The sea salt flavour I liked. I love the different taste of sea salt which definitely differentiates these crisps from normal salt chips. I would probably look out for chips with a lower fat content if just looking for plain salt crisps but having said that if you don&apos;t care about the fat content then these are spot on yummy! I would buy these again and they are very More&apos;ish so watch out! I have always preferred my crisps to have plenty of flavour... which is why "plain salted" has never been one of my favourites. Until now. Wanting to try something a little different, I made up nachos for dinner at the request of my family... but instead of the normal corn chips, I dished it up with these instead. For me, it was a great replacement despite how some of them became not-so-crisps when sitting in the mince for too long, but then, so do corn chips so it wasn&apos;t really that much of a difference... but for my some of my family members, these were far from an ideal substitute. However, as everyone has different tastes, it still proved a point to me and it was easy enough to grab all the crisps from those not wanting them... more for me! These were also the ideal ingredient in a marmite & chip buttie - another classic dish from my early years. Lots of crunch, a good amount of flavour without combining with the marmite to become too salty, and they didn&apos;t go soggy at all! Brilliant! Though I still wouldn&apos;t pick these over a flavoured variety, I would certain pick these over a bulk-produced brand version. They are a much better crisp, and clearly tell you how much... or more accurately how little... actually goes into them. Potato (Agria in fact), oil, salt. That&apos;s it. 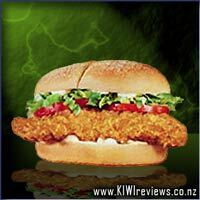 No additives with code numbers, no colouring - either natural or artificial - and most importantly no preservatives! Overall, a great product! And I loved how it even tells you who made that batch, so that if you do, for some reason, have to give quality control feedback... they know exactly who to talk to!